Pre-opening offers are available today for purchase in preparation for the grand opening. While Georgia is renowned for being a golfing state, we want everyone to know that you don't have to be a golfer to have fun at TopGolf -- we have something to entertain everyone. Global golf entertainment leader TopGolf International, Inc. released its pre-opening sales, available starting today at 12 p.m. EST at topgolf.com. These offers come nearly three months before the 60,000-square-foot facility is set to open early May at 10900 Westside Parkway. Residents can track TopGolf’s site progress at topgolf.com/Alpharetta and facebook.com/topgolfalpharetta and @tgalpharetta Twitter. TopGolf is the emerging global leader in golf entertainment, with 10 locations serving more than 2 million guests annually. Players hit golf balls containing computer microchips that track each shot’s accuracy and distance while also awarding points for hitting targets on the outfield. Each facility offers an upscale, laid-back experience that features climate-controlled hitting bays and an impressive food and beverage menu crafted by an executive chef. Mix in dynamic event spaces for groups of all sizes, and TopGolf stands as the premier entertainment complex where the competition of sport meets the neighborhood’s favorite hangout. 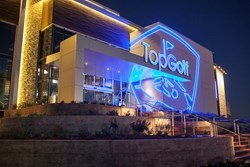 To learn more about TopGolf, visit http://www.topgolf.com.